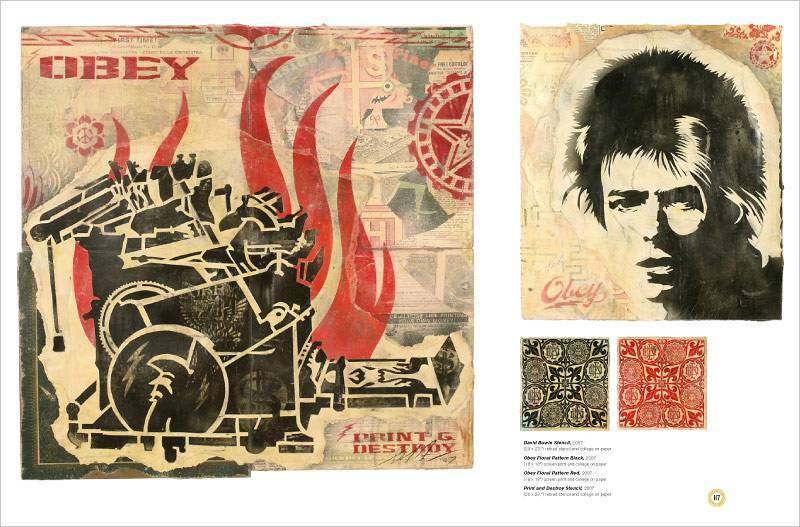 E Pluribus Venom collects a large body of work produced by Shepard Fairey and presented at the Jonathan Levine gallery during his massive exhibition in the summer of 2007. 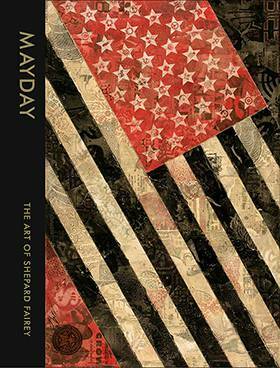 Serving as more than just an exhibition catalog, this book expounds upon themes presented in the show. 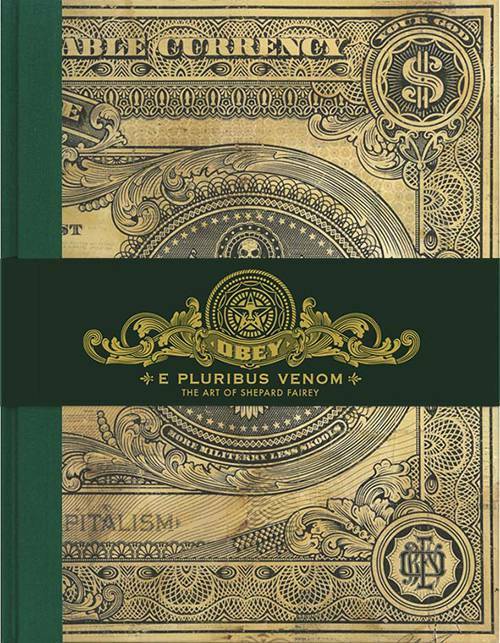 The title “E Pluribus Venom” which translates “Out of many, poison” is derived from “E Pluribus Unum” (out of many, one) an early motto adopted by the U.S. Government which appears on U.S. currency. The artist’s thesis is that many becoming one, or a loss of power and influence of the individual in favor of homogeny is a symptom of a society in decline. E Pluribus Venom is comprised of artworks designed to question the symbols and methods of the American machine and American dream and also celebrate those who oppose blind nationalism and war. Some of Fairey’s works use currency motifs or a Norman Rockwell aesthetic to employ the graphic language of the subjects they critique. 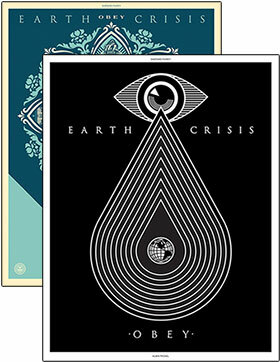 Other works use a blend of Art Nouveau, Hippie, and revolutionary propaganda styles to celebrate subjects advocating peace. 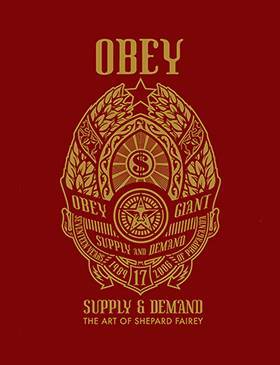 Shepard Fairey is the man behind OBEY GIANT, the graphics that have changed the way people see art and the urban landscape. 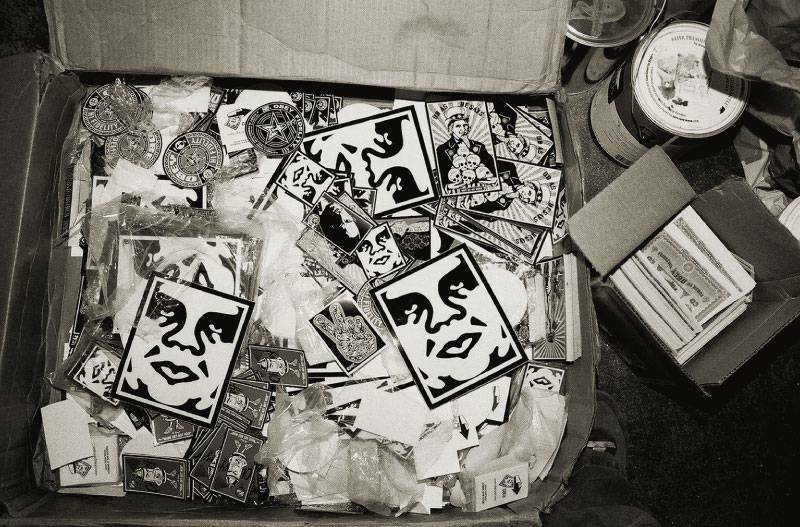 What started with an absurd sticker he created in 1989 while a student at the Rhode Island School of Design has since evolved into a worldwide street art cam­paign, as well as an ac­claimed body of fine art. 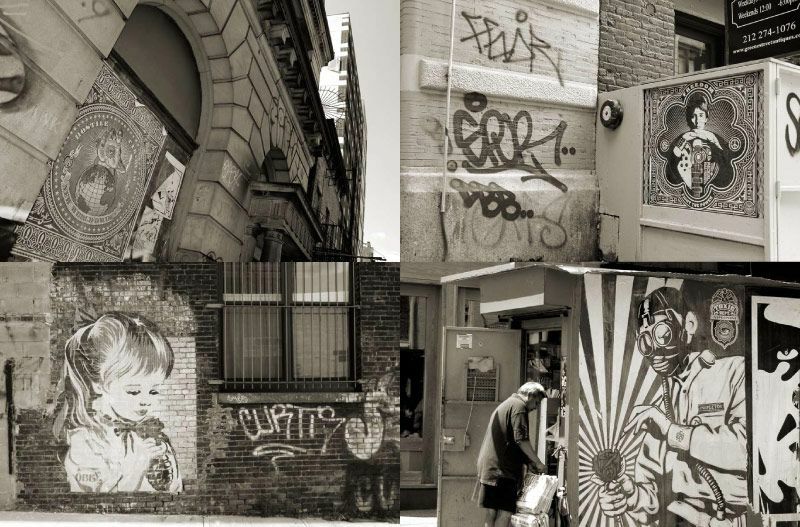 In 2003, Fairey foun­ded Stu­dio Num­ber One, a cre­at­ive design firm ded­ic­ated to ap­ply­ing his eth­os at the in­ter­sec­tion of art and en­ter­prise. 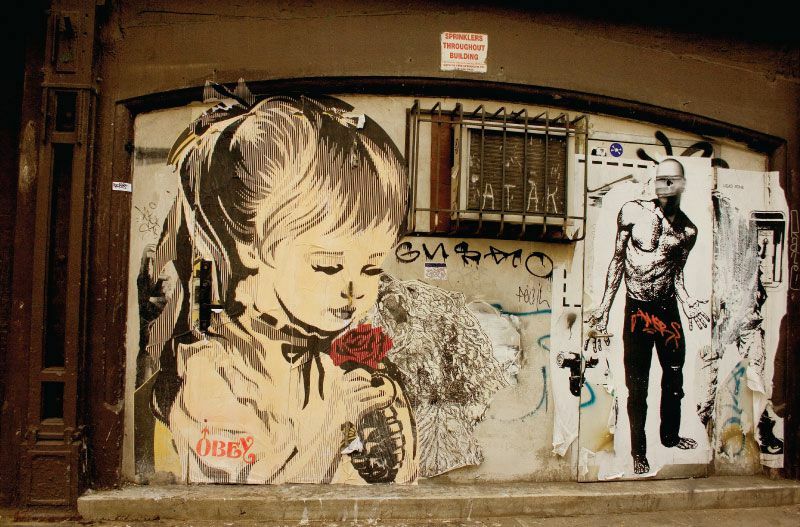 Fairey’s art reached a new height of prominence in 2008, when his “HOPE” portrait of Barack Obama became the icon­ic im­age of the pres­id­en­tial cam­paign and helped in­spire an un­pre­ced­en­ted polit­ic­al move­ment. The ori­gin­al im­age now hangs in the Smith­so­ni­an In-sti­tu­tion’s Na­tion­al Por­trait Gal­lery in Wash­ing­ton, D.C. 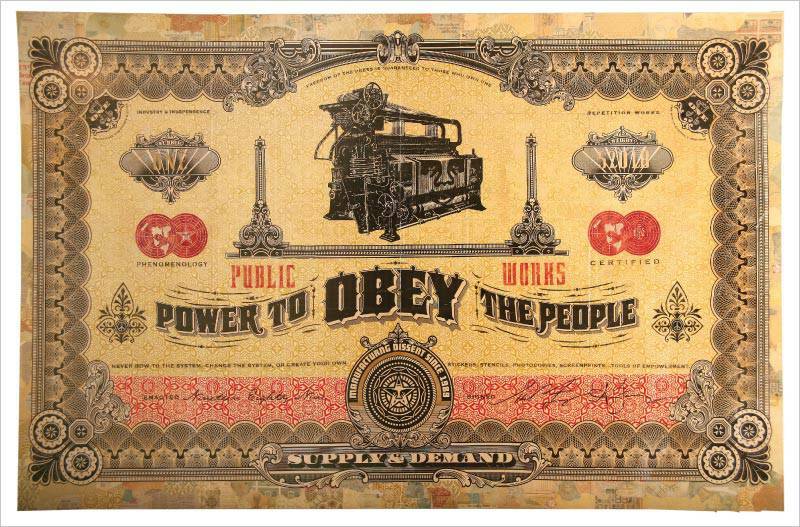 In 2009, the Institute of Con­tem­por­ary Art/Boston honored Fairey with a full-scale solo ret­ro­spective, also titled Supply and Demand. The show will tour the country through 2010. 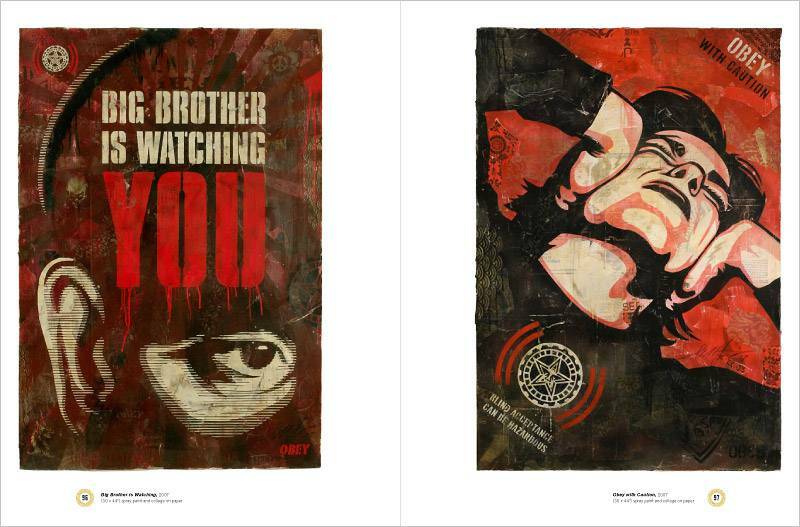 His work has also been exhibited in such museums and collections as The New Museum of Design, New York; the San Diego Museum of Con­tem­por­ary Art, San Diego, CA; the Balt­ic Cen­ter for Con-tem­por­ary Art, New Castle, UK; the Mu­seum of Mod­ern Art, New York; the Vic­tor­ia & Al­bert Mu­seum, Lon­don; and the Los Angeles County Mu­seum of Art.